In this article, you will learn about class and constructor in TypeScript, using Visual Studio Code. This is a fresh series of articles to learn TypeScript from scratch, using Visual Studio Code. 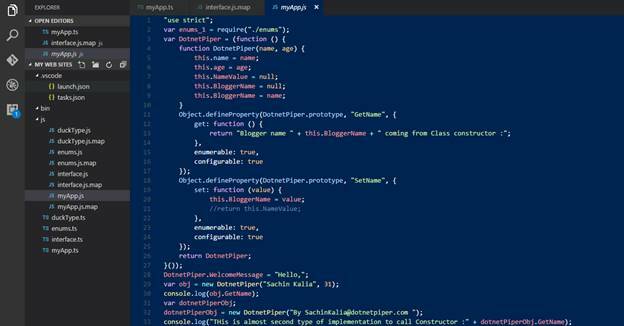 Visual Studio Code is a new editor, which is given by Microsoft. It’s a very rich tool in comparison to Sublime Text and others, and this is my personal observation. I hope you have gone through the last articles. To quickly start with Typescript, click here. After keeping the above excerpt, I have created a class with the code segment given below. In TypeScript, the constructor is only defined with “constructor” name, as defined in code given above as well in the depicted image given below. The second most important factor, which should be remembered during the development phase, is that you are not allowed to create multiple constructors. Instead, you can call constructor without the parameter after defining the optional parameters within the constructor, which is also shown in the image given below, which also prompts an error, as soon as you create another constructor within the same class DotnetPiper. TypeScript permits you to declare overloads but with one implementation and that implementation must have a signature, which is compatible with all the overloads, as I mentioned in the constructor given above. There are other ways also to create a class instance in TypeScript and call the respective class members. The statement given above may be easy for those who are familiar with object oriented languages. There is another way to call static properties, using let keyword, which is given below. This is how you can access the static properties of class in TypeScript. A glimpse of the file, which has class definition and constructor is given below. Hope, it will help you somewhere. I’ll attach a sample application for your reference.